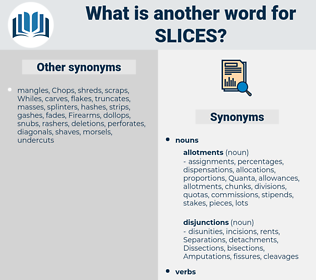 What is another word for slices? fries, times, transects, instalments, Chips, Scales, cuttings, allocations, clearcuts, reductions, neighbourhoods, increments, slabs, dried, headquarters, Neighborhoods, servings, SLATS, PIES, proportions, bowls, directions, commitments, glasses, scraps, slots, shells, divisions, localities, pizzas, fractions, equivalents, steps, districts, tiers, layers, coatings, subdivisions, tranches, Categories, parts, Classes, sectors, wings, blackouts, Clips, sides, fragments, rolls, quarters, washers, levels, lattes, niches, disruptions, stakes, Fractures, rates, LUMPS, scutes, townships, lengths, sheets, Fats, cutbacks, bits, grooves, Angles, harvests, flakes, strips, Slums, holdings, failures, periods, seams, haircuts, breaks, Strata, tribunals, situations, blocks, estates, trenches, brackets, logging, edges, Phases, coupons, napkins, barracks, cups, boroughs, zones, coats, pucks, shortages, shares, ranges, batches, groups, suburbs, diapers, cut-offs, courts, stages, outages, amounts, walks, couches, Tracks, bands, wards, quotas, pull-ups, units, rounds, Nappies, runs. 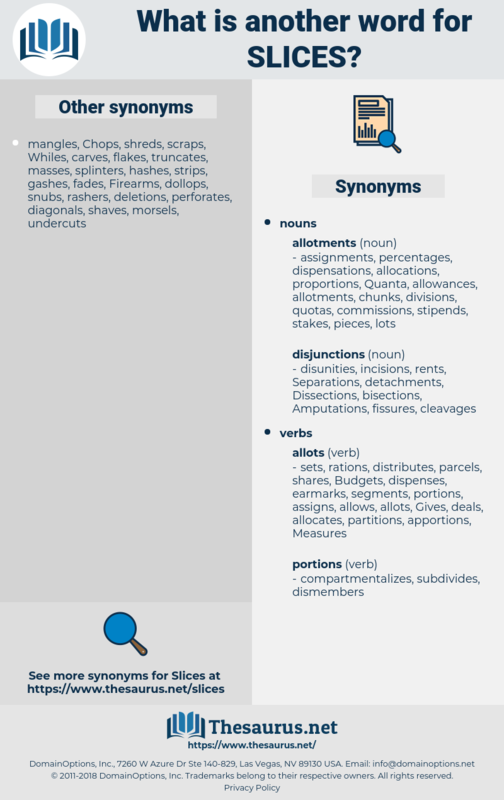 intersects, splits, contrasts, carves, severs, adjudicates, settles, instalments, crosses, snips, cut, brackets, shares, cuts. Oh really, dear, you don't call those slices, do you? He unrolled a brown paper package and revealed two thin slices of bread with a fishing hook stuck in one corner. shoelace, silesia, schulz, sleazy, salicaceae, slush, sialis, soliloquise, syllogise, soulless, sea louse, slag, Sauce Louis, squelch, shekels, silage, shillelagh, slake, souslik, schoolhouse, sacculus, sulky, scalage, silky oak, sleaze, sexualize, shigellosis, solace, shellac, saclike, salsa, saw log, saw-like, slezsko, scaleless, shlock, Sao Louis, suchlike, sluiceway, selachii, siliceous, saxicolous, skywalk, slack, salk, seleucus, slask, sillago, Seljuk, slowcoach, skulk, silex, sills, slews, scalic, slacks, socialise, silk oak, suillus, sls, slouch, salish, schlock, sexualise, salacious, shylock, slog, slash, soliloquize, sales, slough, shoeless, silk, silicosis, sociology, slosh, sleek, syllogize, soleus, sloughy, shell shock, silique, sash lock, sulcus, squalus, sea slug, scale wax, sluggish, shellac wax, Seleucus I, Siskiyou Lewisia, slouchy, slushy, suslik, sclk, sluice, socialize, sexless, seychelles, siliqua, seles, scallywag, silica, sleigh, slug, sulawesi, salix, soliloquy, silky, soul kiss, scoliosis, shell-less, silicious, slick, sulk, saluki, shellack, scalawag, soleless, saw logs, scalelike, silks, seychellois, shoe lace.